Prev St. Patrick’s Day Craft: DIY Necklace Next DIY Easter Egg Crowns! Growing up in Brooklyn in a predominantly Italian- and Irish-American community meant that St. Patrick’s Day was a big deal at my grammar school. Since we didn’t have a school uniform, the kids dressed up in green or rainbow-striped clothing, even if you weren’t of Irish heritage. We were all Irish that day, we were told. Being Portuguese and coming from a very busy two-parent working household (which was uncommon for my neighborhood in the 70s), there were years that my sister and I would forget to dress appropriately for St. Patrick’s Day. 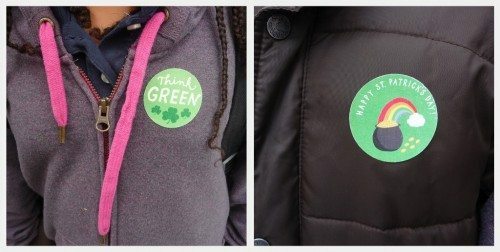 But, the very resourceful lower-school teachers always had St. Patrick’s Day buttons ready for those forgetful kids to wear in school that day to celebrate as well. 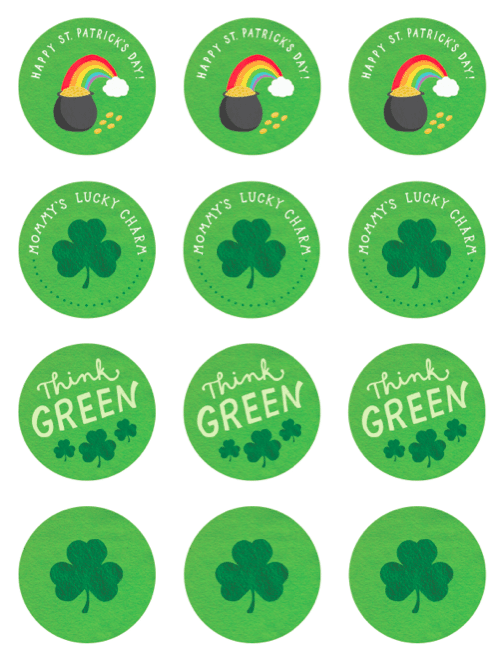 In honor of that memory, I thought it would be fun to have some free St. Patrick’s Day stickers for you all that could work like buttons. This way the kids can wear them, share them with their friends or even decorate St. Patrick’s Day treat bags. Just print out on an entire sticker sheet then use a 2″ circle punch. We have left a little bit of a safe cutting zone for you, so please position your circle punch correctly. You can also print these circles out on white cardstock and make great St. Patrick’s Day tags for gift bags or cupcake toppers (just add to a toothpick).